Excel Productivity Tools Add-ins (Productivity Suite) provide 5 categorized menu tabs in Excel for automated assistants, time saving tasks, advanced charting, efficient data management and specialized financial and risk analytics. Each tab of categorized add-in tools provides a range of specifically designed automated solutions for commonly required tasks in business analysis and data management. The Spreadsheet Assistant includes over 200 time saving solutions for apply actions and math to multiple ranges of data and spreadsheet objects to save time and reduce errors on repetitive data management tasks. The Time Saver tab covers additional customizable and automated routines for formatting, copy, moving, data cleaning, change management and file navigation. The Charting tab provides additional chart types to Excel for advanced data visualization including sensitivity analysis simplification of complex data structures for reporting. The Data tab focusses on data manipulation with consolidation, search and comparison functions combined with data filtering and transformation to perform powerful data mining and analysis. Data extraction, importing and loading tools also provide efficient solutions for integration into other applications. The Specialty tab covers tools for accounting, financial analysis and risk management as well as uncategorized functions, macro utilities and solving algorithms. All add-in tools are provided with detailed instructions and examples to accelerate learning and application of the time saving solutions. 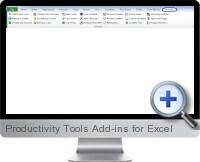 Excel Productivity Tools are compatible with all versions of Excel including Office 365.